Love Obama?Love this! 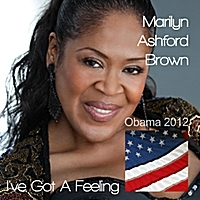 Original version I've Got A Feeling is a soulful, R&B hit which Artist, Marilyn Ashford Brown has revised and re-recorded in support of President Obama's 2012 Re-election. 50% of your contribution will go to Obama For America. This digital revision of the origianal 2009 release titled, I've Got A Feeling is now accompanied by an extended title (Obama 2012). It was originally, inspired by both President Obama's 2008 run for the Presidency and now the 2012 re-election. The overwheliming, international success of the song taken from her Just Doing Me CD has been her most successful to date and she thanks God and the fans abroad for embracing her music. Shortly after the 2009 release she began receiving email inquiries from abroad in response to the cd. As a result Marilyn has traveled abroad to perform in such places as the The United Kingdom, The Netherlands, Costa Brava, Spain and Hamburg, Germany where she shared the stage with Kenney Burk, Dexter Wansel and Al Johnson. Ashford-Brown co-produced the cd along with her Producer, Derek Wille. She still receieves email from as faraway as France inquiring about when the next cd will be released. One fan in particularly, Jean Francois Remy of France, has been and remain the most loyal. Hopefully, being that this is election year, radio and the recording industry here in the States will STOP AND TAKE NOTICE....THIS IS A GREAT CD THAT RADIO STATIONS SHOULD BE PLAYING, especially since she intend to donate 50% of the proceeds to the President's 2012 Campaign....Yes, Marilyn Ashford-Brown's music is addictive! Out of all of the Obama songs that I've heard, this one is very uplifting and inspirational. The music and lyrics (great vocal maturity) are arranged wonderfully with substance and quality. It would not surprise me if this one ends up being adopted as the Official Obama Re-election Song, it should be.